Jason Segel Talks About Playing David Foster Wallace in "The End of the Tour"
Jason Segel gives a performance of enormous compassion and sensitivity as author David Foster Wallace in The End of the Tour. The film is based on the audiotapes of a four-day marathon interview of Wallace by Rolling Stone reporter David Lipsky, played by Jesse Eisenberg. I was a bit self-conscious in doing an interview about a film that explores the essential superficiality of interviews, but Segel was very easy to talk to, curious, forthcoming and thoughtful. So I'm going to start with the headscarf, which your character wears all the time. Was it very constricting? 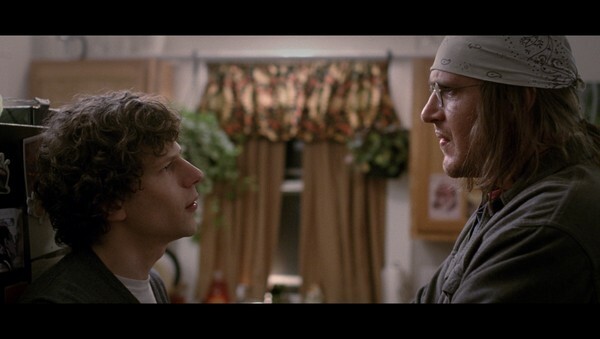 How did it help you think about or like David Foster Wallace? It's an interesting question in that it sort of speaks to a larger thing, which is a big part of my prep was getting to the point where these things did not feel like something other than me. So that I felt comfortable in them and I didn't feel like, "Time to be David Foster Wallace now." I slowly started bringing that stuff into my life in a non-pretentious way a couple months before we started shooting, just so I start to feel comfortable, to feel natural, so by the time we got there and we did everything. I didn't feel like I was in a costume. By the time they said, "Action," my big goal in terms of any vocal change, knowing the dialogue, costume, and hair and makeup, I just wanted to feel natural. Because I just felt like this was one where if you smelled, "Look at this guy trying to do acting," it could've destroyed the movie. Like "Watch Jason Segel now trying to do his dramatic acting. Look, he's really going for it." David Foster Wallace's style of writing seems to me to be like those Russian dolls, one inside another inside another inside another. That's such a good analysis. I think it was on Bookworm, a book show that David Foster Wallace was on a bunch, where the host identified that David Foster Wallace was using fractals in his writing. You know the triangle inside the triangle inside the triangle? Once I heard that, I started looking for it in Infinite Jest, and you really feel these themes popping up in smaller ways within the bigger ways. And it's somebody just hammering home for you these ideas. Writing is a very lonely process. And I write scripts, so that takes three months to write. That's three months of saying, "No, I can't meet you for dinner." And to write Infinite Jest, a thousand plus pages, it's just years and years and years of, "No, I can't meet you for dinner." It's lonely and there's just so much solitude during which you are clinging to the belief that what you're doing is going to be understood, or read, or liked. That's a long time to cling to that idea. So then it comes out, and it does as well as it can possibly do, and I think there's just very complicated feelings associated with that, because now all of a sudden you've gone from solitude to this total hit of energy and 60 percent of the interviews that he must've done for Infinite Jest, somebody asked him, "So what's next?" It's one thing when you're doing a movie and that's how these things work. Jeez. Have some sympathy for the man. He should be allowed to say, "Nothing. I have no idea." He was a very private person. Why did he agree to the interview? Was he lonely? Well, I have to caveat any of these answers by saying these are all guesses. Of course. Okay, so why did the character you played agree to the interview? Oh, that's an easier way to do it. I think that it's the complicated nature of the creative person. Because we have all of these different personality types, but there's something that binds anyone that does something creative. And it is that deep down, under these personality types, is the belief that what you have to express is worthy of people paying money for and devoting their full attention to. That is very particular. I've thought about this a lot separate from this movie. That is something that binds everyone who is doing something creative and puts it out there. Some people are just working in their garage and that's a different thing, but I think that no matter what personality type is layered onto that, whether it be shy, or whether it be arrogant or extrovert, under that, is that you want people to read your stuff, see your stuff, acknowledge your stuff. But I don't read reviews. Not because they're irrelevant to me. I don't read reviews because I will obsess on them. It would be very easy to say, "Oh, it's because I don't care." It's the exact opposite because I will deliberate over every word. Tell me about working with director James Ponsoldt. James and I are about the same age. So he's a contemporary. Judd [Apatow] is a little older than I am, so I viewed him more as a mentor. But I never had a contemporary who saw things in me I didn't even necessarily see in myself or have the guts to act on, you know? I think that there is some part of you that's always looking at work you admire and thinking, "Oh, I can do that," you know? But you don't act on it because you might find out you're wrong. And to have somebody who I admire and who's my age come to me and say, "Hey, I think you can do this," means more to me than -- well, he changed my life. He changed my self-perception. And James has an incredible attention to detail and he's able to construct a pretty tense character narrative underneath the dialogue. There are times when people ask me, "Do you want to direct?" And I see a movie like this and my decision not to direct is confirmed by working with James Ponsoldt because he sees things. You're reminded that directing is a talent and a skill versus just setting up the cameras. There are scenes where, when I first saw the movie and like, "Wait, I had such a long speech, and you just stayed on Jesse's eyes. Oh right, because what this scene was about was this little subtle change in Jesse's eyes because if it hadn't been about that, nothing would've happened in the scene. It would've just been me saying stuff I've said before. Because the entire movie, with the exception of a couple shots, is from David Lipsky's perspective. You and Eisenberg have a lot in common. You both became actors very young and you both write. And you know Jesse's just a few years younger than me, so othat really mirrors David Foster Wallace and David Lipsky. We're both going through our own stuff. I was at the moment that we talked about earlier, Jesse was about to play Lex Luther, which was a very different change, you know? We had a lot to talk about and honestly Jesse is one of the superior intellects I've ever met. He's also an incredibly thoughtful person. And I mean that in the literal sense. Just thinking, thinking, thinking, thinking. And I've been working really hard to think less and to analyze less and to just experience what's happening. And so there were a lot of conversations that really mirrored what we were about to talk about onscreen. What was it like to take on something so different from what you've done before? It came just as I had said to myself, "I need something different." I had just seen this moment where things were coming into a natural end. My TV show was coming to an end, this cycle of comedy I was doing was starting to not be reflective of where I was as a man. Especially when you write a lot of your own stuff. And so all of a sudden, I was at a point where what I was putting out wasn't reflective of who I was anymore, and I just had a moment where I felt like, "Okay, you need to think about where you are now and start doing stuff that's reflective of that or else this is not going to be sustainable." I have models around me of not making the change and it's not pretty, you know? And it was scary for me because it was what I knew and was what I was told I was good at. And then this script came around, and the line in the script where I made the decision was when he said, "I'm 34 years old but I have to face being alone in a room with a piece of paper." I was 34 and I write and I was like, "Yes, that's it." And then we were off to the races.